This paper introduces three quantitative indicators to conduct research for characterizing Northeast China cold vortex persistence activity: cold vortex persistence, generalized “cold vortex,” and cold vortex precipitation. 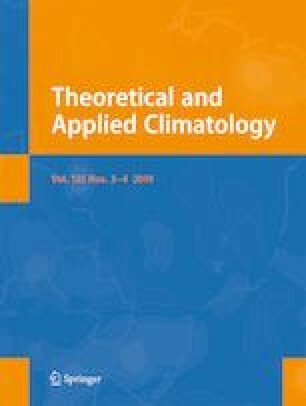 As discussed in the first part of paper, a hindcast is performed by multiple regressions using Northeast China precipitation from 2012 to 2014 combination with the previous winter 144 air-sea system factors. The results show that the mentioned three cold vortex index series can reflect the spatial and temporal distributions of observational precipitation in 2012–2014 and obtain results. The cold vortex factors are then added to the Forecast System on Dynamical and Analogy Skills (FODAS) to carry out dynamic statistical hindcast of precipitation in Northeast China from 2003 to 2012. Based on the characteristics and significance of each index, precipitation hindcast is carried out for Northeast China in May, June, July, August, May–June, and July–August. It turns out that the Northeast Cold Vortex Index Series, as defined in this paper, can make positive corrections to the FODAS forecast system, and most of the index correction results are higher than the system’s own correction value. This study provides quantitative index products and supplies a solid technical foundation and support for monthly precipitation forecast in Northeast China. We thank Dr. Feng Guolin for the help in collecting data and result analyses. Comments from He Wenping and Feng Aixia in the National Climate Center of China and Li Guoping in the National Meteorological Information Center are very helpful and the reviewers significantly improved this manuscript. This study was financially supported by the National Natural Science Foundation of China (41741021, 41405094, 41630424, and 41530531).